What is paroxysmal nocturnal hemoglobinuria (PNH)? What are the signs and symptoms of paroxysmal nocturnal hemoglobinuria (PNH)? What is the prevalence of paroxysmal nocturnal hemoglobinuria (PNH)? How is paroxysmal nocturnal hemoglobinuria (PNH) inherited? Which specialties of health-care professionals treat paroxysmal nocturnal hemoglobinuria (PNH)? How is paroxysmal nocturnal hemoglobinuria (PNH) diagnosed? What is the treatment for paroxysmal nocturnal hemoglobinuria (PNH)? What is the prognosis for a person with paroxysmal nocturnal hemoglobinuria (PNH)? PNH is a rare, chronic disease that causes rapid breakdown of red blood cells and can result in reddish or cola-colored urine, often seen in the early morning after urination. PNH is due to a spontaneous mutation in gene material. PNH is not inherited. It is genetic, but is due to a spontaneous mutation that individuals do not pass on to their children. Diagnosis of paroxysmal nocturnal hemoglobinuria is sometimes difficult since many symptoms are nonspecific but the patient's history, physical exam and urine tests such as flow cytometry, light sensitivity tests, sugar water or sucrose tests, and others demonstrate red blood cells break up easily. Radiologists can use MRI and/or ultrasound to demonstrate blood clots that might compromise a person's blood flow with PNH. Although transplantation of stem cells can treat people with paroxysmal nocturnal hemoglobinuria, such treatment is reserved for the most severe cases because of transplant-associated high risk morbidity and mortality. However, the drug Soliris (eculizumab) can increase the quality of life and lifespan of most people with PNH. The prognosis for people with PNH that is diagnosed and treated appropriately ranges from good to fair, depending upon the individual's response to treatments. People who have PNH, but are not treated for the disease, have a prognosis of fair to poor due to a reduced lifespan. Paroxysmal nocturnal hemoglobinuria or PNH is a rare and chronic disease that results in an abnormal breakdown of red blood cells. PNH is due to a spontaneous genetic mutation that causes red blood cells to be deficient in a protein, leaving them fragile. Because the kidneys help to filter out waste products from red cell breakdown, when urine is concentrated overnight as a person with PNH sleeps, the morning urine may be reddish to a darker, cola color. This led to term the problem as "nocturnal." One of the red blood cell products that the kidneys metabolize into the urine is hemoglobin (hence, "hemoglobinuria"). Because urine discoloration occurs irregularly due to physiological changes, the disease was thought to occur irregularly and so was termed "paroxysmal." What Causes a Genetic Disease? mitochondrial inheritance (for example, MELAS, a form of dementia). The prevalence or occurrence of PNH is very uncommon and there are very few statistics about this disease. However, experts estimate that the disease occurs about 5 to 10 times less frequently than aplastic anemia (also an uncommon disease). PNH can occur in males and females at any age. It is most frequently found in adults with the median age of diagnosis being 45 years old. PNH is not inherited. It is due to a spontaneous genetic mutation that occurs in the PIGA gene. The mutation makes stem cells that are deficient in a protein. Mutated stem cells that are not malignant (cancerous) can still increase in numbers by normal clonal expansion to produce red blood cells that are not normal. If the mutated stem cells increase in numbers, then PNH symptoms can develop. There may be other factors that are not well understood that encourage the proliferation of the mutated stem cells. Experts suggest the factors causing bone marrow failure may play a role in PNH development since there is a close association between PNH cells and the development of aplastic anemia and myelodysplastic syndrome. Because PNH is not inherited, individuals do not pass the spontaneously mutated gene to their children. Individuals that are diagnosed with PNH can be monitored by their primary care physicians. However, specialists such as hematologists, internists, transfusion specialists, immunologists, radiologists, and dietitians (to ensure adequate vitamin and iron intake) are often consulted to help diagnose and care for the patient with paroxysmal nocturnal hemoglobinuria. Because symptoms of PNH can mimic other common diseases, it can be somewhat difficult to diagnose initially. However, health-care professionals may suspect PNH from the patient's history and from screening exams such as white blood cell count that shows anemia and discolored urine that is not infected. a sugar water or sucrose lysis test. All of the specialized tests show that the patients' red blood cells are abnormal and fragile. In addition, other tests may suggest PNH because they can demonstrate intravascular hemolysis (for example, an elevated reticulocyte count, elevated serum lactate, low or absent serum haptoglobin, and others). Radiologists can use MRI and/or ultrasound to demonstrate a blood clot (thrombus) that may be compromising the blood flow in a person with PNH, for example, to the liver or other organs. 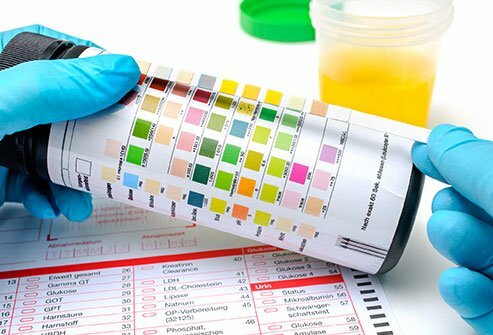 These tests can help distinguish PNH from other problems such as typical and atypical hemolytic - uremic syndromes and other kidney - related diseases that cause blood or hemoglobin to be in the urine. Although the ideal treatment for PNH is to replace mutated stem cells, transplantation of stem cells is reserved for the most severe cases because of difficulty of matching histocompatibility antigens from the donors to the patient and because stem cell transplantation is associated with fairly high morbidity and mortality. Fortunately, in 2007, the drug Soliris (eculizumab) was approved by the US FDA to treat the hemolysis associated with PNH. Although the drug doesn't treat the underlying cause (genetic), it can improve the quality of life and lifespan of the person with the disease. However, experts recommend that individuals be vaccinated against serogroup B Neisseria meningitidis before receiving the drug. Some experts recommend giving prophylactic antibiotics daily. Bone marrow hyperplasia that occurs with PNH can be treated with anti-thymocyte globulin (ATG) while anemia can be treated with various types of transfusion products. Corticosteroids have been used to reduce the effect of complement – mediated red blood cell breakage. Leading cause of death in patients with PNH is blood clotting (thromboembolism). Some experts recommend that the patients that have had previous thrombosis be placed on anticoagulation medications. Treatment protocols are designed for each patient, patients are urged to discuss their treatment protocols with their doctors and to keep all follow-up appointments. Although extremely rare, a few patients may spontaneously resolve PNH. But for most patients, treatments are needed for the rest of their lives. The prognosis or outcome for a person with PNH that is diagnosed and treated, especially if treated with eculizumab, ranges from good to fair, depending upon the person's response to treatments. Individuals with PNH that are untreated have a prognosis of fair to poor due to a reduced lifespan (about 10 years after diagnosis), frequently ended by a devastating thrombotic (blood clot) event. REFERENCE: Besa, E. C., MD. "Paroxysmal Nocturnal Hemoglobinuria Treatment & Management." Medscape. Updated Jun 29, 2016. How many bones are in the human body? How much blood is in the human body? How many muscles are in the human body? How many cells are in the human body? How much water is in the human body? Learn about human body anatomy, human body systems, and organs. What�s your biggest challenge with living with PNH or paroxysmal nocturnal hemoglobinuria? What symptoms do you experience with paroxysmal nocturnal hemoglobinuria? Please share your experience with treating and managing paroxysmal nocturnal hemoglobinuria symptoms? Proxysmal nocturnal hemoglobinuria can be difficult to diagnose. Please share your experience with determining your diagnosis of PNH. What changes have you had to make to your routine since being diagnosed with PNH? Abdominal pain can have many causes that range from mild to severe. Some of these causes include bloating, gas, colitis, endometriosis, food poisoning, GERD, IBS (irritable bowel syndrome), ovarian cysts, abdominal adhesions, diverticulitis, Crohn's disease, ulcerative colitis, gallbladder disease, liver disease, and cancers. Signs and symptoms of the more serious causes include dehydration, bloody or black tarry stools, severe abdominal pain, pain with no urination or painful urination. Treatment for abdominal pain depends upon the cause. Blood clots can occur in the venous and arterial vascular system. Blood clots can form in the heart, legs, arteries, veins, bladder, urinary tract and uterus. Risk factors for causes of blood clots include high blood pressure and cholesterol, diabetes, smoking, and family history. Symptoms of a blood clot depend on the location of the clot. Some blood clots are a medical emergency. Blood clots are treated depending upon the cause of the clot. Blood clots can be prevented by lowering the risk factors for developing blood clots. Chronic cough is a cough that does not go away and is generally a symptom of another disorder such as asthma, allergic rhinitis, sinus infection, cigarette smoking, GERD, postnasal drip, bronchitis, pneumonia, medications, and less frequently tumors or other lung disease. Chronic cough treatment is based on the cause, but may be soothed natural and home remedies. A complete blood count (CBC) is a calculation of the cellular makeup of blood. A CBC measures the concentration of white blood cells, red blood cells, platelets in the blood, and aids in diagnosing conditions and disease such as malignancy, anemia, or blood clotting problems. Deep vein thrombosis (DVT) is a blood clot in the deep veins, and can be caused by broken bones, trauma to a limb, immobility, medications, smoking, cancer, genetic predisposition, and cancer. Symptoms of a deep vein thrombosis in a leg are swelling, tenderness, redness, warmth, and pain. Treatment for DVT include medications and surgery. The definition of a genetic disease is a disorder or condition caused by abnormalities in a person's genome. Some types of genetic inheritance include single inheritance, including cystic fibrosis, sickle cell anemia, Marfan syndrome, and hemochromatosis. Other types of genetic diseases include multifactorial inheritance. Still other types of genetic diseases include chromosome abnormalities (for example, Turner syndrome, and Klinefelter syndrome), and mitochondrial inheritance (for example, epilepsy and dementia). Hemoglobin is the oxygen-carrying protein molecule in the blood, specifically in the red blood cells. High hemoglobin count may be caused by dehydration, smoking, emphysema, tumors, or abuse of Epogen. Low levels of hemoglobin may be caused by anemia, blood loss, nutritional deficiency, bone marrow problems, chemotherapy, kidney failure, or sickle cell disease. Coughing is a reflex that helps a person clear their airways of irritants. There are many causes of an excessive or severe cough including irritants like cigarette and secondhand smoke, pollution, air fresheners, medications like beta blockers and ACE inhibitors, the common cold, GERD, lung cancer, and heart disease. Natural and home remedies to help cure and soothe a cough include stay hydrated, gargle saltwater, use cough drops or lozenges, use herbs and supplements like ginger, mint, licorice, and slippery elm, and don't smoke. Over-the-counter products (OTC)to cure and soothe a cough include cough suppressants and expectorants, and anti-reflux drugs. Prescription drugs that help cure a cough include narcotic medications, antibiotics, inhaled steroids, and anti-reflux drugs like proton pump inhibitors or PPIs, for example, omeprazole (Prilosec), rabeprazole (Aciphex), and pantoprazole (Protonix). diseases of the male reproductive organs.